Evening primrose oil has become a preferred treatment for a number of conditions including eczema, high cholesterol and rheumatoid arthritis. 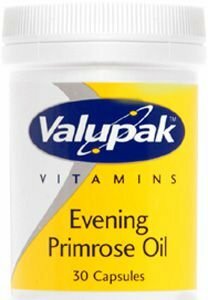 Evening primrose oil is also considered to have healing properties and can help with skin problems and diseases. Evening primrose oil has been shown to ease menstrual and menopausal problems for women. One capsule per day with food or liquid. Keep out of the reach and also the sight of children. Each capsule provides: Evening primrose oil 1000mg, Vitamin E 10mg (100% RDA). No artificial additives.